Today I got my two film cameras closed through eBay auctions (boy I hate dealing with eBay). My Hasselblad 500C system (above) was by far my favorite, but alas, it was more than three years since I'd run a roll of film through the camera (and Hasselblads don't like to not be used). 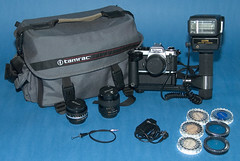 The Nikon FE2 was my workhorse 35mm film system (below) and that hadn't been used in more than a year. I really hated to part with either camera, but they weren't doing me any good sitting in the closet, and drooling over the Nikon D2X made me realize that it was time to let it go. Drie and I still have one film camera (the Nikon N80), but most of the time we're using the digital SLR (Nikon D100). With any luck we'll be looking at the Nikon D2X soon, but its soooooo pricey!